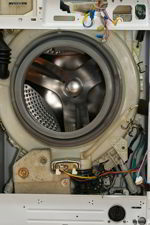 This article is about removing the heating element from front loading UK washing machines. Removing the heater can be very difficult. Don’t do it unless you are sure it needs replacing and you are very proficient at repairing things. Very often you cannot get a heater back in place once removed. This is because of the way they are fitted (as described later). If you’ve tested the heater with a meter and know it is faulty read on. Otherwise check this article first – not heating up the water – is heater faulty?. Where is the heater on a washing machine? If you are lucky the heater is behind the back panel. If so it’s extremely easy to get access once the back panel has been removed. More commonly though it’s right at the front of the main outer drum under the door seal (see pic above). This means the front panel has to be removed – or even the entire casing with some designs. How easy this is varies from model to model and brand to brand. So it’s impossible to give specific instructions. Some washing machines even have the front panel welded in so it can’t be removed. If you don’t have the skills to work out how to take something to pieces and put it back together get an appliance engineer. Every washing machine heater I’ve ever seen is secured in place in exactly the same way. At the top of the element there is a metal plate. Underneath is a thick rubber seal. The metal plate has a bolt in the centre which is threaded through the centre of the heater and seal. You can see this bolt in the centre of the heater even when fitted in the machine. It has a nut on it. When the heater is slotted into the machine this nut is tightened down which draws the plate towards it and squashes the rubber seal. It squashes it quite a lot, and makes it jam inside the machine to be water tight. If you look at the picture on the left you can see a brand new heater with the thick rubber seal. When new, the heater snugly slots into place. But after the bolt is tightened up and left for a few years the rubber can become bulbous and hard. This makes it very hard to get out, and impossible to fit back in. Some will come out easily enough and go back OK, but don’t remove one unless it needs replacing or you have to. So, to remove a heater you need to undo this nut, unscrew it to the top of the thread but don’t remove it. Then push the bolt in to move the plate inside away from the seal. You may have to use a hammer and something to punch it with but not something which will damage it. Once the plate is pushed back the heater can be levered out but again you have to be careful because most are fitted into only plastic tubs and you can easily break it. Note that even with the nut and thread pushed right back the heater can be extremely difficult to get out if the rubber seal has gone hard. I’ve had some very tough struggles. You have to pull or lever the rubber seal out all the way round the heater. If the rubber seal has remained pliable and not gone too bulbous it may come out reasonably easily. If not you have to use a mix of screwdrivers, pliers and even pipe pliers to wrestle it out. Do not break the plastic around the heater! To fit a heater you need to slot it in place being careful to ensure you locate the end of the heater into the heater bracket at the bottom of the tub. This bracket is essential to stop the drum hitting the heater on spin with a heavy load inside. It should either be a little bracket sticking up or maybe there is a cover designed into the tub and the heater just fits underneath it. Once slotted in place the nut in the centre needs tightening down to draw the metal plate up against the rubber. Don’t over tighten it, tighten it firmly enough to squash the rubber properly. If the metal on the heater starts to bend in you are over tightening. Try to pull it out with a firm tug to make sure it doesn’t come out. If you’ve needed to use WD40 or similar to get the heater in (you shouldn’t need to with a new heater) you need to be especially careful it won’t come out. If it comes out it will create a serious flood. I once refitted an old heater and needed to use WD-40 to get it back in. It looked OK but it popped out halfway through a wash and flooded a kitchen. How tight you need to tighten it is something that engineers learn from trial and error. Unfortunately, doing something only once with no previous experience can go badly wrong. My washing machine wasn’t heating on opening to access heater element the neutral wire plastic casing had melted and disconnected. Having reattach via crimping, are the plastic connections available to purchase, or is there an alternative? Can just soldering the wire on be safe, or is there ampage with the plastic connectors? Live is happily sitting sturdy. I can see earth us crimped secure. Hello Claire, you need to use 13 amp terminal connectors but they are very difficult to find – especially online because there are many that look exactly the same in a photo but are different sizes and amp ratings in reality. I would try somewhere like Maplins but go to a shop and make sure they are rated for 13 amps and the right size. Any electrical shop should have them. Most of them need a proper crimping tool to fit them though but some can be crimped manually with pliers. However, if you do not attach them properly they could overheat and burn out! I have a 10+ year old Bosch WFT2830 washing machine. It keeps tripping despite a new heater element and NTC sesonor. Any ideas what else the cause might be. It can be very hard to get one out. If you’ve followed the instructions in my article regarding the nut and plate then it’s down to carefully levering it out bit by bit. If fitted into a plastic plate you have to be careful not to break anything. Basically the rubber flange seal that holds the heater in place and seals it can become very hard and squashed and it can be very difficult to get one out if the washing machine is several years old. replaced my heater but now having problems connecting connectors as i only have pliers. what kind of crimping tool do i need? also one of the connectors broke so can i use 1.5mm² – 2.5mm² / 16 – 14 AWG. connector to replace? ive asked seller amps but they just gave me these details. Hi James. You need 13 amp connectors. You can buy a proper tool for them. Try Tandy who should sell both. I used to sometimes connect the old type with little tabs that fold over the wire and the cable with pliers and narrow nosed pliers but I can only recommend you use the proper tool. If they are the ones with a round plastic part that the wire shoves into I’d definitely use the proper tool. tandy dont sell the connectors maplin only sell 6A, i need Push- On Receptacle Female Spade Connector but when i ask on amazon they just tell me the wire gauge not amps. i have a bare wire so anytype of connector would be good a snap on would be better as i dont have a crimping tool. Actually now you mention it I meant Maplin. I suppose their market is more small appliances and devices. I’ve discussed amp tags before in the comments so read them all to get more information. It’s very important to get good quality 13 amp tags and that they are fitted properly. Otherwise the wires can overheat and burn or the tags can shake off. Those tags are the ones I used to use by the way. It’s hard to find a crimping tool for them because most amp tags now use the round plastic (red blue or yellow) connection method. Without a crimping tool they can be safely attached with care though. With the wire stripped back enough to allow the copper wire to lay inside the smaller inside tabs and ensuring the plastic cable is resting inside the larger outer tabs carefully bend over and tightly squash the open tabs with *narrow nosed pliers. Normal pliers are too big. Then tug firmly on the wire to ensure it’s all connected properly. ah thanks thats what ill get. but they didnt seem to know amps. They are only for car radios so not likely to be 13 amp. Plus they don’t have the little tag in the centre for preventing tag from vibrating off. Having said that they will only work if your element has a small hole or indentation for it to clip into. They are only for car radios so not likely to be 13 amp. Plus they don’t have the little tag in the centre for preventing tag from vibrating off. Having said that they will only work if your element has a small hole or indentation for it to clip into. Finally, it’s not so advisable to fit those tags without the proper tool. Simply squashing the end with pliers may not be good enough. I’ve got a stuck indesit heating element in washing machine and someone trying to help has fully removed nut! Hello Graham. Yes, you have to read the article. It gives explicit instructions. You do not remove the nut. Hello Tom. You need to check the heating element with a continuity test meter to see if it is faulty. Otherwise you’re just guessing. The first article I link to in the article above is about how to test a heating element. Hello Andy. I had to disassemble my washing machine to retrieve an important ring that was is in the sump hose. First, I tried to remove the heating element, however it was stuck and it didn’t came out. Now, as I was assemble the machine back together the nut in the heating element is pushed inside it. What can I do? Do I have to buy a new heating element? How can I bring it out? Hello Inês. Full instructions on how to get the heating element out are in this article. If you mean that you have taken off the nut and the thread that it screws onto has been pushed inside you will need to take the heating element out to push it back from the other side. As my article describes though, it may be that the rubber seal on the heating element has become distorted and hard and will not go back. In which case you will need to buy another one. Good advice, but . I don’t understand the bit about the chance of the drum hitting the heater on spin with a heavy load. Doesn’t the gap between the inner and outer drums stay pretty constant unless the bearings are completely knackered, and then it would hit the bracket anyway. I thought the reason for heater bracket was to locate the heater to make sure it wasn’t installed at the wrong angle maybe touching the drum in the first place. Is this wrong? Hello Colin. The heater bracket is there to hold it in the right place but also to stop the drum hitting it. There is a gap between the heater and the drum, but on spin, with a heavy load, the drum somehow stretches or wobbles in such a way that it can clip the element. The movement in the drum is likely to be minor, but maybe the absence of a bracket also allows the element to move slightly upwards towards the drum. In any case the heater would only be hit by the drum with heavy load and on fast spin. With a light load on fast spin it would not hit at all. Also, if by any chance the element was to warp it would also help hold it away from the drum or the (now) plastic drum. It was a very common fault on old Hoover washing machines when they used to use vitreous enamel outer tubs. Their heater bracket was just a bit of metal sticking out that the element slotted in to. It was welded to the bottom of the tub and unfortunately commonly rusted away and fell off. When it did, the washing machine worked perfectly OK except when spinning a heavy load of towels or sheets. Then the drum would clatter the element on every revolution and make a very loud metalic tapping noise about 3 times a second. Eventually this would damage the element and it would commonly fuse the electrics when the element’s insulation broke down. These days most heater element brackets tend to be little shelves built into the mould of the plastic outer tub (drum) that the element just slides under. If properly designed it should be impossible to fit it incorrectly.